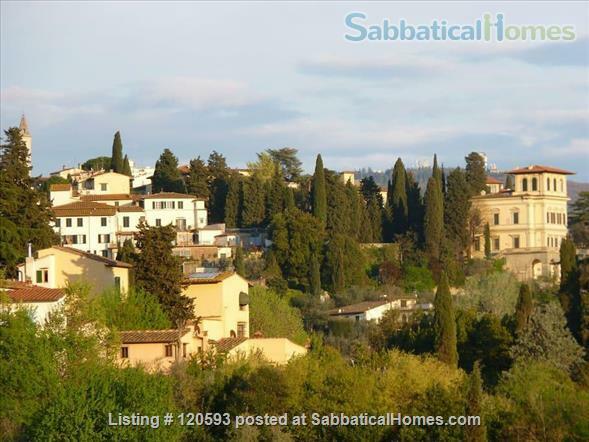 The semidetached house is located on the historic Villa Strozzi-Riccardi estate, originally belonging to a famous Renaissance family. We are at the foothill of Settignano, in front of Villa I Tatti grounds, in the land, as Bernard Berenson intended, to “serve as a protection against the invasion of the suburbs and to promote a feeling of free space and of distance”. The former Riding Stable is an 18th-century building, and recently it has been completely restored and cleverly transformed into a romantic, well-equipped guest house. Three hundred meters away from the village of Ponte a Mensola offers a restaurant, a grocery, a primary school and kindergarten, the bus stop to reach the center in just 15 minutes: you can easily just walk in 15 minutes to go work , a rare privilege in a crowded city like Florence. Here you live in a green resort, far away from the bustle of the city with its humming motorbikes and honking cars. While the location is very quiet, it is only a short bus ride into the city. This unique open space keeps its original structure and rooms derive from the horse stables which still preserve the hand-painted majolica tiles. The interior is about 90 mq (1000 sqft), has a very high ceiling and a loft. On the ground floor you will find one double bedroom, a fully equipped kitchen, a dining room, a living room, a cloakroom; a studio in the loft, with two twin beds, and two bathrooms complete the apartment. Perfect for two people, it easily can accommodate (and has accommodated) a family with children. In front of the glass entrance door a private courtyard (80 mq) paved with ancient terracotta tiles is at your disposal and leads to the garden and park (a huge equipped space, a paradise for children of any age) surrounded by meadows and olive groves.